When you sync overdue Outlook tasks to your Google account using CompanionLink, they now get summarized into a sorted list (by date) and entered as a calendar event for the current day. The calendar event is called Overdue Tasks. This is extremely useful for people who use Outlook tasks with Google, and tend to lag behind the due dates they set on those tasks. Previously, you would loose sight of those tasks as they fail to show up on your calendar after a certain point in time. The latest build of CompanionLink for Google fixes that by having all overdue tasks summarized for you in a single calendar event. 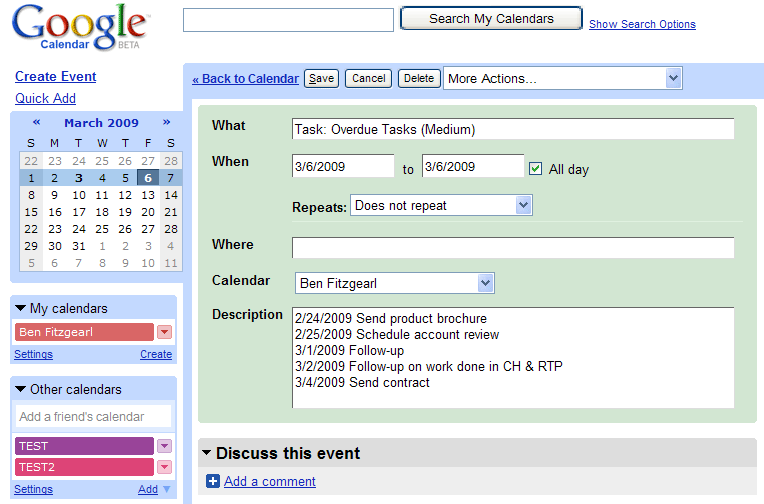 Here’s a screenshot of how Overdue Tasks look in your Google calendar. This entry was posted in CompanionLink Products and tagged google tasks, outlook tasks, overdue tasks, tasks by Rushang. Bookmark the permalink.